Reducing reliability on landfills and keeping our coastal environment clean and safe for our future generations is the mission of New Hanover County’s recycling division. As part of the county’s solid waste management system, the recycling division collects a variety of materials from the waste stream for recycling. The recycling team services eight drop-off sites throughout the county on a daily basis. These sites are for the convenience of county residents that want to recycle materials that would otherwise be placed in their garbage containers. The main recycling processing facility (located at 3002 U.S. Highway 421 North) welcomes sorted recyclables from commercial sources. Aluminum Cans and Steel Food Cans – Any metal container used for soup, pet food, vegetables, condensed milk, etc. Rinse out cans before recycling. Batteries – Alkaline and lithium batteries, rechargeable Nickel-Metal Hydride (NiMH), Lithium Ion (Li-Ion), and Nickel Cadmium (NiCad) batteries can be recycled – just look for the light blue “igloo” receptacle. Learn more about how to recycle batteries here. Cardboard – Flatten cardboard boxes and do not place Styrofoam in the cardboard containers. Cartons – Milk, juice, soup, broth, wine, cream, egg substitute cartons, etc. Glass Bottles and Jars – Glass bottles & jars do not need to be color separated. Rinse clean before recycling. Electronics – If it runs off of a battery or has a plug, it can be recycled! Learn more about recycling electronics here. Mixed Paper – Office paper, magazines, paper bags, cereal and food boxes, craft paper, wrapping paper, junk mail, brochures, catalogues, and phone books are accepted. Staples and paper clips do not have to be removed. Newspaper – Newspaper inserts can be recycled as well. Plastic Containers – Please no plastic bags, films, or styrofoam. Milk jugs, soda and water bottles, detergent bottles, (plastics #1 and #2 only). Rinse out container and caps/lids should be left on. *All materials except for cardboard and glass can go into the “MIXED RECYCLING” containers. There are separate marked containers for cardboard and glass. *No plastic bags please! Return them to a grocery store that offers plastic bag recycling. The drop-off site at Blair Elementary School has been closed due to pending school construction. This site has been relocated to Ogden Park. Residents in the Wilmington city limits can learn more about recycling services here. Recycling has numerous benefits, including protecting our water quality, reducing air pollution, saving needed landfill space, conserving natural resources, creating jobs, and providing industry with raw materials for new products. Leave plastic bottle caps on for better recycling. Remove and discard lids from glass containers, though. Dispose of plastic pumps from containers for liquid soaps, fertilizers, etc. before recycling the bottle. Plastic bags and plastic film can’t be recycled with your residential recycling, so dump the plastic bags…use paper bags or no bag at all for your recycling bin at home or at our drop-off sites. Plastic bags can be recycled at most grocery stores. Rinse out food and beverage residue from cans and bottles. You don’t have to rinse your containers until they’re spotlessly clean before recycling them. When recycling paper, you don’t need to remove paper clips and staples. That’ll make it easier for your office to recycle more! Recycle your old batteries. An easy way is to collect old batteries in a container with a tight-fitting lid…once it’s full, bring it to a battery recycling location in New Hanover County! Avoid using electrical tape on battery contacts – it makes it harder to identify the battery type for our sorters. 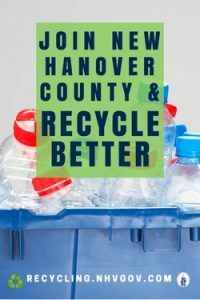 Clear tape is OK.
New Hanover County is pleased to partner with Sonoco Recycling, LLC for the processing and marketing of collected recycled materials at the county’s Materials Recovery Facility (MRF). This facility serves New Hanover, Pender, and Brunswick counties and processes over 25,000 tons of recyclables per year. It is the only MRF in Southeastern North Carolina and many of the recovered materials are shipped worldwide through the Port of Wilmington.